Efficient transmission of tactile information is vital for individuals who rely on their sense of touch to interact with and navigate their surroundings, including visually impaired persons. Somatosensory phenomena have been investigated with respect to surface topologies and neuron sensitivities in the skin, but there is little knowledge of the specific skin tribology when reading tactual-coded information such as braille. Braille is a tactual code that employs raised dome-shaped dots in six-position cells (2 columns by 3 rows per cell), with various dot patterns representing individual text characters, punctuation or mathematical operators. Due to the hypothesized significance of friction on tactile sensitivity, the authors investigated the effect of basic braille dot configurations on friction coefficient in fingertip sliding. Initial studies investigated the effect of multiple dot-row configurations and media type on friction coefficient, but the tribological effect of individual features and associated skin interactions was ill-defined. Subsequently, the frictional effect of an individual dot of varying radius was investigated and modeled against a multi-term frictional model implementing Hertzian contact, the Greenwood–Tabor hysteresiscomponent of a spherical indenter against a soft surface, as well as Wolfram׳s traditional adhesion model. The results of the study show that macro-scale deformation of the fingerpad during fingertip-on-dot sliding is the primary friction mechanism and suggest that the contribution due to a macroscopic feature is largely independent of sample medium. Based on this understanding, the effect of braille dot spacing on a dot׳s friction contribution was investigated. The results from the spacing study indicate that the fingerpad׳s interaction with dot pairs is highly influenced by dot feature spacing. Further work is necessary to identify the fundamental sliding mechanics at the finger-dot interface, but the ability to identify the frictional mechanisms as well as the sliding interactions will provide a means to understand how much of a role friction plays in braille character recognition, as well as suggest potential friction-based methods to enhance the information density of braille codes. This is a manuscript of an article published as Darden, M. A., and C. J. Schwartz. 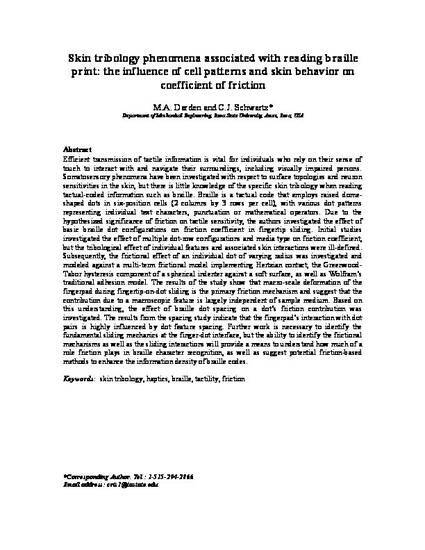 "Skin tribology phenomena associated with reading braille print: The influence of cell patterns and skin behavior on coefficient of friction." Wear 332 (2015): 734-741. DOI: 10.1016/j.wear.2014.12.053. Posted with permission.